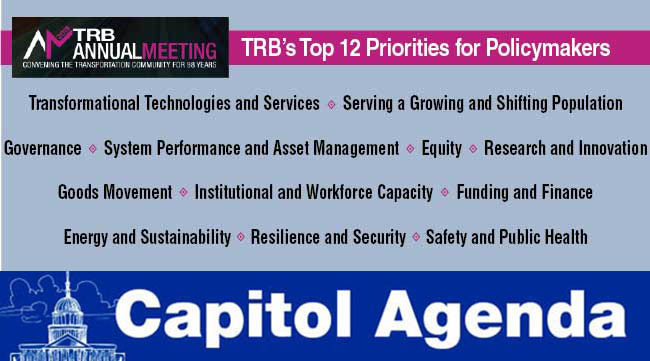 The dozen themes policymakers should address, sooner rather than later, to ensure a viable transportation network include identifying sustainable funding for infrastructure projects and promoting the safe movement of people and goods, according to the organizers of this year’s annual meeting of the Transportation Research Board in Washington. It’s no small task, but the officials who run transportation agencies need to try their best. Improving the way things connect is vital for a thriving economy. Policymakers also should focus intently on formulating rules for autonomous vehicles. Because, in case you haven’t noticed, cars are already driving themselves. Overall, the critical issues entailed steering the technology revolution; serving a growing and shifting population; protecting the planet; preparing for threats; safeguarding the public; serving the disadvantaged; managing our systems; improving the performance of transportation networks; paying the tab for infrastructure; moving freight; providing a capable and diverse workforce; and preparing for the future. Policymakers, did you get all that? Jan. 13-17: The Transportation Research Board hosts its 98th annual meeting, titled “Transportation for a Smart, Sustainable and Equitable Future.” Speakers include Transportation Secretary Elaine Chao. Jan. 15, 9:30 a.m.: The Senate Judiciary Committee meets with William Barr, to review his nomination to become attorney general. Jan. 15, 10 a.m.: The National Press Club hosts a discussion titled, “Review of the 2018 Hurricane Season & Forecast for the Future.” Speakers include Gerry Bell, hurricane climate specialist and research meteorologist at the National Oceanic and Atmospheric Administration Climate Prediction Center, and Jeremy Gregory, research scientist at the Massachusetts Institute of Technology Department of Civil and Environmental Engineering. Jan. 16, 10 a.m.: The Senate Environment and Public Works Committee meets with Andrew Wheeler to review his nomination to become administrator of the Environmental Protection Agency. Jan. 16, 10 a.m.: The Senate Commerce, Science and Transportation Committee holds its organizational hearing. ROADRUNNER: Shareholders of Roadrunner Transportation Systems, who have seen the value of their holdings plummet after a finance scandal that led to the dismissal of several top executives more than a year ago, are being given a chance to buy more stock — 900 million shares to be exact — at 50 cents a share as part of an effort by new management to recapitalize the business. PARKING ZONE: Indiana, Iowa, Kansas, Kentucky, Michigan, Minnesota, Ohio and Wisconsin launched the Trucks Park Here program on Jan. 4. HIGHWAY MAN: AASHTO Executive Director Jim Tymon hosted a conference call Jan. 8 to discuss his goals for leading the agency in 2019. The Highway Trust Fund, which assists states with maintenance and construction projects, is expected to go bankrupt in 2020. Tymon, who started in this role Jan. 1, pledged to work with Congress to put the trust fund on solid ground. Are you flying soon? Note: Air traffic controllers are working without pay. We can do roads, bridges, and transit with an increase in the gas tax and then that would continue, and probably, if we did it, we probably adjust it for inflation. A Day in the Life of The Freshmen. Thanks for reading Capitol Agenda. We publish weekly when Congress is in session. E-mail emulero@ttnews.com with tips. Follow us @eugenemulero and @transporttopics.